Fashion tips for the Petite Over-50s - and Link Up | Is This Mutton? It's All About Proportion. Or is it? Five famous faces: Eva Longoria, Scarlett Johansson, Selma Hayek, Kylie Minogue and Emilia Clarke. What do they have in common? Apart from being gorgeous, they're all petite - below 5'3 inches (160 cms). If you too are petite, you may also be pointing out that the famous five are all very slim, whereas you may be curvy, top heavy or pear shaped. Fear not, I have pulled together some tips and know-how on how to shop and dress for your body shape, and I have also included some guidance if you have smaller than average feet and wrists, which often goes with being petite. 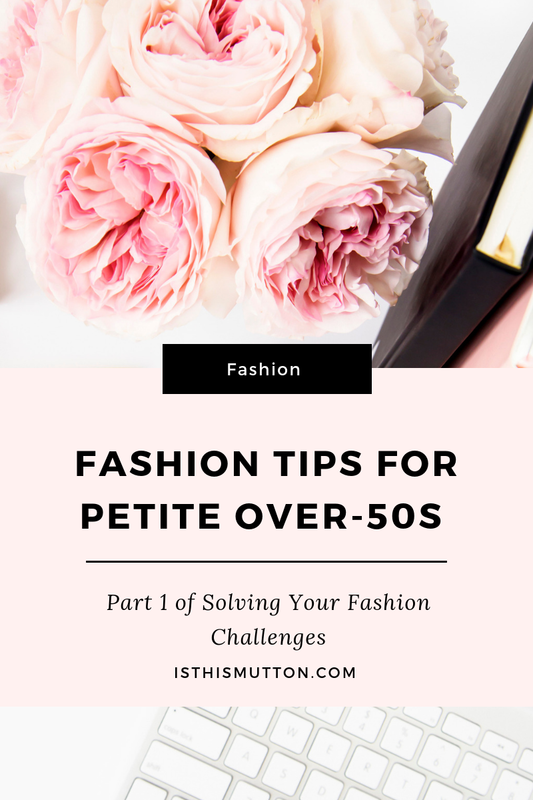 London 50 plus blogger Petite Silver Vixen is keen to explode a few myths about rules on how petite women should dress, Most say that proportions are important: the two-thirds one-third rule, but Jacqueline says it all depends on your shape. Crop tops and knee length skirts are often recommended as ideal for petite women, but Jacqueline points out: "My body ratio is long legs, short torso, slightly bigger than average bust size. I have to be careful that a crop top doesn't end up making my legs look even longer and my torso even shorter, thereby throwing my proportions off even more!" That doesn't mean though that crop tops are out of bounds. Jacqueline shows how to wear a crop top with tailored trousers and says the secret is to wear a crop that's slightly longer, resulting in the flattering two-thirds-one-third proportion. Another "rule" is that petite women should opt for a skirt length that hits just below the knee as opposed to mid calf. But over-50s blogger Laurie Bronze from Vanity and Me shows time and time again that midi skirts can work beautifully on the petite frame. The secret is making sure that your top half balances the bottom half. Showing off your waist, whatever your shape, will even you out, but equally if you’re slender , a looser top will still work – try to ‘bag’ it a little to disrupt the sense of a column. falling away into a long skirt can be very flattering. Make sure the dress is a petite fit so the body of the dress falls to the waist and not below. Let's hone in on three petite body types. Petite and top heavy is defined as an Inverted Triangle shape with shoulders wider than your hips and large busted, which makes you look bigger up top than your bottom half. Your torso is longer than the length of your legs. Pamela Graham at Style Yourself Confident says for this body type the ideal is to visually balance slender hips with the width of broad shoulders, achieving horizontal balance. For vertical balance, minimise your top half and elongate the bottom half. If you're apple shaped, you'll have a shapely bust, slender hips and good legs and will carry any additional weight around the midriff. As a petite, you can balance your proportions by making your legs look a bit longer. This can be done with color, as well as high heels and wedges. If you're a petite with an hourglass figure, lucky you. Scarlett Johanson and Salma Hayalk are two examples of women with the most typical petite hourglass body type. Form-fitting jackets or jackets that nip in at the waist with a flare at the hip will look great on you. The flare should be balanced with a structured or princess shoulder. If you want a dramatic effect to enhance your feminine figure, wear tops with added volume to the bust and shoulders AND a snug fitting empire waist. You can it paired with a proportionally voluminous bottom to balance out the top. Wrap-style tops are flattering to almost all petite women, and even more so if you have the hourglass figure, because they accentuate your waist and enhance your small waist. Asos stocks over 1,500 petite pieces starting from size 2. On top of its own petite range, there are also a whole host of brands specialising in items designed for women at 5 ft 3 in tall. Marks and Spencer, Next and Debenhams also have good selections in their petite ranges. Jeetly is a premium brand for UK petite women, while Jennifer-Anne also has great tailoring specifically for petites. In the US, Chico's, Nordstrom, Soft Surroundings, Eileen Fisher and J Crew are the go-to brands for petites. Being petite means you often have smaller feet, both width and length-wise. Laurie Bronze from Vanity and Me says: " I'm a size and a half! It's always been hard to find the right shoes. The best brand that I have found for shoes is Pretty Small Shoes. They have the tiniest of sizes available." Other brands include Cinderella of Boston, Small Feet Shoes (UK based but ship globally). 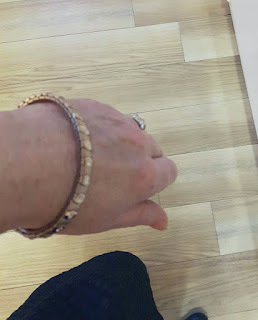 A lesser-known challenge facing the petite woman is finding bracelets which aren't too big. Petite blogger Annemarie from Mutton Style recommends Leo Mazzotti. "They have a limited variety but what they do have is classy. I bought these two in a 2 for 1 offer in the summer. Look how this fits my petite wrist. This style is not adjustable so whilst its perfect for small wrists it's perhaps not so for larger. I was really impressed with the quality and chic look." If you have any recommendations for petite clothes, shoes and jewellery, do share in the comments! Get Your Wow On ladies! Last week's #WowOnWednesday readers' favourite was Alison at Midlife and Beyond, with her tips on styling a classic checked midi skirt. Hi Gail. Thanks for mention. I'd also add that this dress thstvi wore in the blog link here when I went to tea with you is perfect for petites, and in the sale if it's still available. Hope the link is ok in comment. I'll add it to link up too for you.